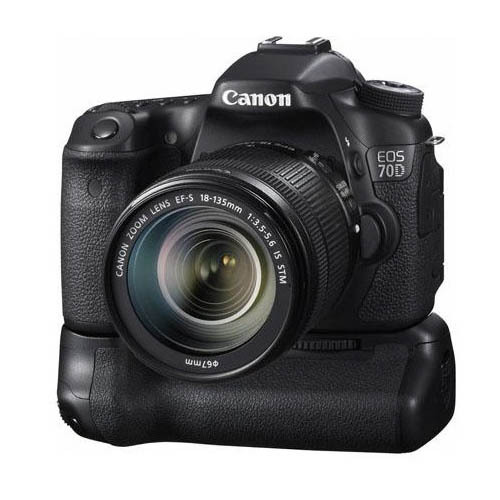 Canon has officially announced the new Canon EOS 70D. The EOS 70D features a new 20.2 MP APS-C CMOS sensor, designed and manufactured by Canon. It’s the first Digital SLR in the world to feature ground-breaking Dual Pixel CMOS AF technology, which delivers smooth and accurate autofocus (AF) when shooting Full HD movies and fast AF acquisition when shooting in Live View mode. Paired with the 14-bit DIGIC 5+ processor and 19-point all cross-type AF System, the EOS 70D captures incredible, full resolution images at up to 7 frames per second, with up to 65 JPEG or 16 RAW images in a single burst. Additionally, a native ISO range of ISO 100-12800 enables photographers to shoot in lower light conditions and use faster shutter speeds whilst retaining high image quality. The camera will come as a body only package or kitted with either the EF-S 18-55 IS STM or the EF-S 18-135 IS STM.